Filed to: Weeeeeee!Filed to: Weeeeeee! Torn from the Just Jared "Gisele Bundchen: Bikini Pooltime with Tom Brady!" 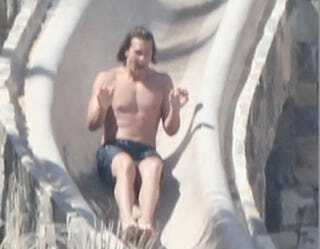 headlines comes this wonderful shot of the New England Patriots quarterback totally enjoying the pool slide at a Mexican resort. The H/Ts go to tipster Juan V. and Oh No They Didn't. The opportunity to provide a caption for said photo goes to you.